This feature is a follow up to the ‘Then and Now’ article we published two years ago, shortly after the GTX 980's release, when we looked at 5 generations of flagship GeForce GPUs. The idea is to give you a performance perspective of multiple graphics card generations spanning several years. Whether you are looking to upgrade from an older GPU or simply appreciate the statistical significance of the data presented, last time we were able to gather that in five years we had seen close to a 3x bump in graphics horsepower. Since publishing that article, Nvidia had made two more major product releases, both based on the Maxwell architecture: the GTX Titan X and 980 Ti. Purely from a gaming perspective the Titan X became irrelevant rather quickly once the 980 Ti landed mere weeks later. The GTX 980 Ti was a notable upgrade over the regular 980, offering over a third more CUDA cores for a reasonable 18% bump in pricing. Now with the release of Pascal the time has come to revisit history and see how six generations of Nvidia GeForce graphics cards compare. To streamline testing we’ll be sticking to DirectX 11 titles which is supported by all GeForce series, old and new, so we can accurately compare them. The comparison table below shows the eight GPUs that will be part of our test. 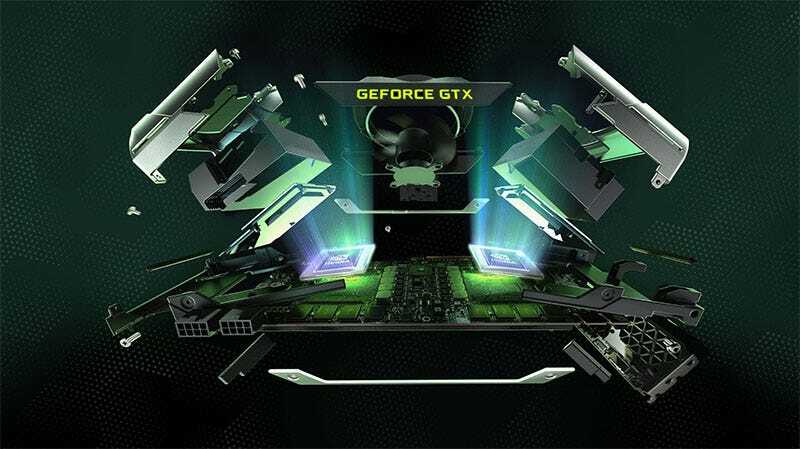 The list includes four major Nvidia architectures released between March 2010 and June 2016: Fermi (GTX 480 and GTX 580), Kepler (GTX 680 and GTX 780), Maxwell (GTX 980 and 980 Ti) and the company’s most recent GPU architecture, Pascal (GTX 1080). The GTX 480, GTX 580 and GTX 680 were clearly the single-GPU flagships for their series, while the GTX 780 was really an extension of the GTX 600 range and when it landed it was second only to the GTX Titan — excluded from this write-up because at $1,000, it was in a different class and hardly made sense to the average gamer for the price. Six months after the GTX 780 shipped we got an even faster GTX 700 series GPU, the GTX 780 Ti. This was followed almost a year later by the GTX 980, and again this major release was eventually accompanied by the faster 980 Ti variant along with the flagship Titan X. It is worth pointing out that the GTX 1080 is only the beginning for the Pascal architecture, so a faster, more polished variant in the form of a GTX 1080 Ti or similar is expected next year. First up we have Crysis 3 and like most of the games featured in this article this title is getting on a bit now at 3 years old. Even so, at 2560x1600 it does still present a real challenge and with anti-aliasing disabled the GeForce GTX 1080 averaged just 68fps, though that did make it 42% faster than the 980 Ti. It is crazy to look back and see GPUs such as the GTX 480 averaging just 16fps at the same resolution, making the 1080 over 4x faster. What’s more is the GTX 480 averaged just 42fps at the lowly 1366x768 resolution. Even though the GTX 480 was released 3 years before Crysis 3 these results are still surprising. BioShock Infinite isn’t nearly as demanding as Crysis 3 and for that reason the GTX 1080 is able to average well over 100fps at 2560x1600 and in fact the 980 Ti also broke the 100fps barrier. This time the GTX 1080 was just 23% faster than the GTX 980 Ti and 57% faster than the GTX 980. The GTX 1080 also remained over 4x faster than the old GTX 480. When testing with the popular Tomb Raider reboot the GTX 1080 averaged 122fps at 2560x1600, making it quite a bit faster than the GTX 980 Ti, 39% faster in fact. What’s interesting here is the fact that at this resolution the GTX 1080 was 6x faster than the GTX 480 and almost 5x faster at 1366x768. Although Battlefield 4 will also be 3 years old later this year, it is a game we still benchmark with today due to its popularity and still very impressive graphics. At 2560x1600 the GTX 1080 was 30% faster than the GTX 980 Ti which averaged 77fps opposed to 100fps. The GeForce GTX 1080 was 29% faster than the GTX 980 Ti at 2560x1600 with an average of 75fps in Metro Redux. This meant the GTX 1080 was 63% faster than the GTX 980, 97% faster than the GTX 780 Ti and 121% faster than the GTX 780. Again it was over 4x faster than the now 6-year-old GTX 480 which averaged just 17fps. Sleeping Dogs is a game we used for testing quite a lot as it was extremely demanding on the GPU. Here we see the GTX 480 and GTX 580 with their limited 1.5GB memory buffer getting completely decimated at 2560x1600. The GTX 680 faired considerably better, though with an average of just 26fps it didn’t exactly provide playable performance. The GTX 680 did pick up the pace at 1920x1080 and was very fast at 1366x768. Looking at the top of the pack we find the GTX 1080 leading the GTX 980 Ti by a healthy 38% margin, the GTX 1080 was also 90% faster than the 980! At 2560x1600 the GTX 1080 was almost 9x faster than the GTX 480 and over 4x faster at 1366x768. Thief was another big title of 2014 and we had to wait till the GTX 980 Ti was released before it could be enjoyed at over 60fps at 2560x1600. The GTX 1080 takes things to the next level, with a 41% performance boost averaging 90fps, while we run into a system bottleneck at 1366x768. Watch Dogs is still a visually impressive title, though when using the GTX 1080 it does start to show its age as frame rates hovered above 100fps at 2560x1600. The GTX 1080 was 26% faster than the GTX 980 Ti and 69% faster than the GTX 980. Dragon Age: Inquisition is one of the newest games tested so far as it was released in late 2014. Clearly the title even today is still very demanding, as the GTX 1080 averaged just 77fps at 2560x1600 making it 31% faster than the GTX 980 Ti which averaged 59fps. We have come a long way since 2012’s GTX 680 which rendered just 27fps on average.